Another Iranian citizen has been sentenced to execution for particiapting in an anti-government riots at the end of December, the ISNA news agency reported on Tuesday. A total of 12 people have been sentenced to death. “Nine leaders of the Ashura troubles have been condemned — one to capital punishment and nine to prison sentences,” said ISNA, quoting the Tehran prosecutor’s office and without providing details. Eight people were killed and hundreds more hurt in the December 27 demonstrations on Ashura, a Shiite Muslim holy day, the latest in a series of protests over what many in Iran believed to have been the rigged re-election of President Mahmoud Ahmadinejad in June. Hundreds more people were arrested during or after the Ashura protest. Meanwhile, senior justice official Seyyed Ebrahim Raissi said another nine people already condemned to death are awaiting the outcome of an appeal. “Their case is before the appeals court and its decision must be awaited,” he said. Of the 12 people in total condemned to hang, two were executed on January 28. Mohammad Reza Ali Zamani and Arash Rahmani Pour had been convicted of being Mohareb (enemies of God) after being charged with plotting to topple the Islamic regime. Reporters sans frontières said today that it deplores the fact that, as a result of arrests in the past few days, the number of journalists and netizens detained in Iran now exceeds 65. At the same time, the Internet has been experiencing a great deal of disruption since the evening of 6 February and some mobile phone companies are no longer allowing users to send SMS messages. The measures appear to be part of a concerted effort by the authorities to prevent opposition protests during the Islamic Revolution’s 31st anniversary celebrations on 11 February. Reporters Without Borders has not received any news of several other journalists and netizens who were also reportedly arrested in recent days. The press freedom organisation has learned that Ali Mohammad Islampour, editor of the Qasrnews blog and editor of the Navai Vaghat newspaper, was arrested on a charge of “publishing false information liable to upset public opinion” on 3 February after being summoned by a revolutionary court in the western city of Kermanshah. In a press release yesterday, the intelligence ministry announced the arrests of seven journalists for “collaborating with Zionist satellite TV stations.” The journalists are accused of “receiving professional training abroad in the preparation of a velvet revolution,” disturbing public order and “collaborating with Radio Farda (Radio Free Europe).” A senior Radio Farda representative denied the allegation and said the station had no journalists in Iran. In an open letter to international media that have been invited by the Iranian authorities to cover the 31st anniversary celebrations, ten Iranian exile journalists said they had detailed information from Iran about the government’s plans to give the impression that it is supported by most of the population. It not only wants to prevent an opposition rally on Azadi Square, where President Ahmadinejad will give his speech, but also to ensure that there will only be government supporters in the square, the letter said. Inviting foreign journalists to cover the Islamic Revolution’s official anniversary was a trap, the journalists wrote. A government that has already arrested, jailed and charged journalists working for foreign news media, now wanted to demonstrate its popularity to the entire world and thereby conceal the protests, they said. The Iranian regime has started another mass trial of government opponents before a Tehran revolutionary court for their role in protests against President Mahmoud Ahmadinejad’s disputed re-election, including the major demonstrations on Dec. 27, the journalism freedom advocacy group Reporters sans frontières announced. The group said on its website that all of the 16 defendants in the latest trial, which began on Jan. 30, are accused of being “mohareb” (enemies of God) and “corrupt on earth” – charges that carry the death penalty – and of activities against national security. They include Omid Montazeri, a young reporter for various newspapers, who was arrested on Dec. 28 because of journalistic activities that have included giving interviews for news media based abroad. Montazeri, who wrote for Shargh and Kargozaran, newspapers that have been closed by the government, was arrested after responding to a summons to report to the revolutionary court. The previous day, 27 December, plain-clothes agents from the intelligence ministry searched his home and arrested his mother, Mahin Fahimi. Following Montazeri’s arrest, both were transferred to an unknown place of detention. Various sources say Montazeri is being pressured to confess links to organisations based abroad that are opposed to the regime. His lawyer has not been able to visit him or see the prosecution case file. He has also not been told when Montazeri will appear in court and has not been allowed to go to the court. “The regime intends to make Montazeri suffer the same fate as his father, who was murdered 21 years ago, in 1988, like many other political prisoners,” Reporters Without Borders added. As in the previous Stalinist-style show trials in August, the defendants are not being allowed to talk to their lawyers, who are unable to find out what their clients are alleged to have done. Instead, the Tehran state prosecutor has appointed defence lawyers with the links to the intelligence services. Alireza Saghafi, the editor of Rah Ayandeh (a magazine closed by the authorities in May 2008), was arrested on 1 February after responding to a summons to go to the intelligence ministry. On the evening of the same day, computers and books were seized in a search of his home. A member of the Iranian writers’ association, he was previously arrested on 1 May 2009, an hour before the start of May Day demonstrations, and was freed on 10 June on payment of 70 million toman in bail. He was summoned several times before his arrest. As ceremonies marking the 40th day of mourning for Ayatollah Hossein Ali Montazeri’s death were taking place on 29 January, police arrested several people including Ali Asharf Fathi, a theologian at the Koranic school in the religious city of Qom who edits the Tourjan website. A moderate known for criticising extremists, he is the son of a famous Revolutionary Guards commander who was killed in the Iran-Iraq war. Photographer Mehraneh Atashi and her husband were arrested on 12 January. After working for various international media for several years, Atashi had recently decided to concentrate on artistic photography. It is not known where she and her husband have been held since their arrest. Internet connections have meanwhile been slowed right down in several cities ahead of the Islamic Revolution’s 31st anniversary, as they have been during all events likely to be used by the opposition to stage demonstrations. Several websites have been also been the targets of attacks by hackers, including the Radio Zamaneh website, which was attacked by the “cyber-army,” a Revolutionary Guards group. Reporters sans frontières reported today that six months after Iran’s disputed June 12 presidential election, the news and information are still being sensored by authorities, and journalists are being persecuted at a frightening rate. More than 100 journalists have been arrested since the election and about 50 have fled into exile. A dozen newspapers have been closed by the authorities and access to thousands of Internet pages has been blocked, the advocacy agency said. Within hours of the announcement of President Mahmoud Ahmadinedjad’s election “victory,” journalists were being arrested by the intelligence ministry, Revolutionary Guards and other security services. Most were taken to Tehran’s Evin prison. At least 100 journalists and bloggers have been arrested since 12 June and 27 are still being held. Iran is one of the world’s five biggest prisons for journalists. Like Chile’s national stadium in Santiago after the 1973 military coup, Evin prison has been turned into a massive holding centre for political detainees, most of whom are mistreated and subject to considerable psychological harassment. Some journalists have been freed in exchange for the payment of exorbitant sums in bail, after being given prison sentences ranging from five to nine years. Others have been released pending trial. Meanwhile, journalists continue to be harassed in the major provincial cities such as Mashhad, Isfahan, Shiraz and Tabriz, where they are often summoned, interrogated and threatened. Give the report a read. Our biggest problem in the United States is keeping our jobs. Journalists in Iran are fighting for their lives. Maziar Bahari, a journalist with dual Canadian and Iranian citizenship who is Newsweek’s Iran correspondent, was freed on bail on Saturday. report on the human-rights situation in Iran. He had been held without being charged in prison in Iran since June 21. While this long awaited news is extremely welcome – there remain concerns that Bahari’s ability to leave the country may be restricted. Bahari’s wife, Paola Gourley, is expecting the birth of their first child on October 26, in England. 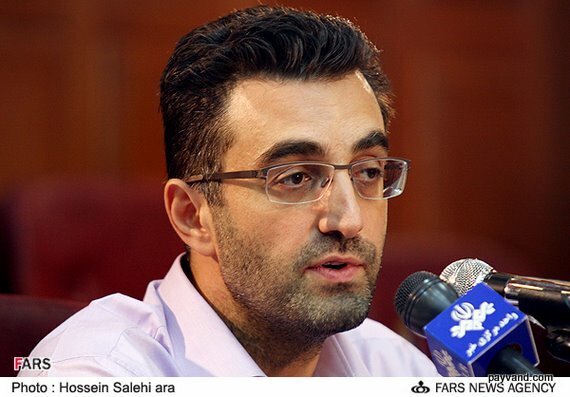 Bahari was freed on payment of 300 million toman ($372,500) of bail after 120 days in Tehran’s Evin prison. He is still awaiting a trial on undetermined charges. Meanwhile, the Iranian authorities are refusing to provide any information about Hossein Derakhshan, a blogger with dual Canadian and Iranian citizenship who has been held for nearly a year. The Associated Press is reporting this afternoon that a leading Iranian cleric, Ayatollah Ahmed Khatami, during his Friday sermon at Tehran University called for the execution of the protest leaders as a means to stopping dissent and to provide a lesson to the opposition. “Anybody who fights against the Islamic system or the leader of Islamic society, fight him until complete destruction,” he said in the nationally broadcast speech. The cleric alleged that some involved in the unrest had used firearms. He reminded worshippers that Iran’s supreme leader, Ayatollah Ali Khamenei, rules by God’s design and must not be defied. The cleric also lashed out at foreign journalists, accusing them of false reporting, and singled out Britain for new criticism. Meanwhile, USA TODAY’s Ken Dilanian is reporting today that President Barack Obama is planning to fund groups that support Iranian dissidents. This would be a continuation of a program that became controversial when it was expanded by President George Bush, and would could contradict earlier administration statements that the United States is not providing support for the dissidents. The U.S. Agency for International Development has for the last year been soliciting applications for $20 million in grants to “promote democracy, human rights, and the rule of law in Iran,” according to documents on the agency’s website. The final deadline for grant applications is June 30. U.S. efforts to support Iranian opposition groups have been criticized in recent years as veiled attempts to promote “regime change,” said Trita Parsi, president of the National Iranian American Council, the largest Iranian-American advocacy group. The grants enable Iran’s rulers to paint opponents as tools of the United States, he said. Although the Obama administration has not sought to continue the Iran-specific grants in its 2010 budget, it wants a $15 million boost for the Near Eastern Regional Democracy Initiative, which has similar aims but does not specify the nations involved. Some of that money will be targeted at Iran, said David Carle, a spokesman for the appropriations subcommittee that oversees foreign affairs. “Part of it is to expand access to information and communications through the Internet for Iranians,” Carle said in an e-mail. President Obama said this week the United States “is not at all interfering in Iran’s affairs,” rejecting charges of meddling that were renewed Thursday by Iranian President Mahmoud Ahmadinejad. President Mahmoud Ahmadinejad today rebuffed any notion of welcoming President Barack Obama’s “open hand” gesture in remarks quoted in The New York Times and attributed to the Iranian Fars news agency. Obama had sent a letter to Iran’s supreme leader, Ayatollah Ali Khamenei, before the election calling for an improvement in relations, The Washington Times reported on Wednesday. “Our question is why he fell into this trap and said things that previously Bush used to say,” he said, according to Fars, quoted in western news agency reports. I am pressured to abandon my demand for the vote annulment … a major rigging has happened … I am prepared to prove that those behind the rigging are responsible for the bloodshed … Continuation of legal and calm protests will guarantee achieving our goals. Seventy Iranian academic leaders were arrested yesterday after they met with opposition leader Mir-Hossein Moussavi, the defeated presidential candidate’s website says today. It is unclear where they are being held or for how long they will be detained. According to state media, 17 people have died in the violence that has gripped the country, and opposition forces say hundreds have been held. President Barack Obama sent a letter to Iran’s supreme leader, Ayatollah Ali Khamenei, calling for an improvement in relations, according to interviews and the leader himself, Barbara Slavin of The Washington Times is reporting. Ayatollah Khamenei confirmed the letter toward the end of a lengthy sermon last week, the Times said, in which he accused the United States of fomenting protests in his country in the aftermath of the disputed June 12 presidential election. The letter was sent before the election, and its exact contents are not known. Administration officials have been reluctant to talk about the letter a day after Obama gave his strongest condemnation yet of the Iranian crackdown against protesters. The Washington Times quoted an anonymous Iranian government source as saying that the letter was sent between May 4 and May 10, and laid out the prospect of “cooperation in regional and bilateral relations” and a resolution of the dispute over Iran’s nuclear program. The Iranian told the Times the letter was given to the Iranian Foreign Ministry by a representative of the Swiss Embassy, which represents U.S. interests in Iran in the absence of U.S.-Iran diplomatic relations. The letter was then delivered to the office of Ayatollah Khamenei, the Times said.